Rediscover the joy of home cooking through the eyes of one Brooklynite who swore off restaurants for two years. The story behind the scenes of the blog Not Eating Out in New York, The Art of Eating In chronicles Cathy Erway's journey through the underground of NYC eating, and her favorite recipes along the way. Two years, three apartments, countless food events and some strange restaurant-free “dates” later, she was able to turn eating in into something of an art, rather than mere survival method. 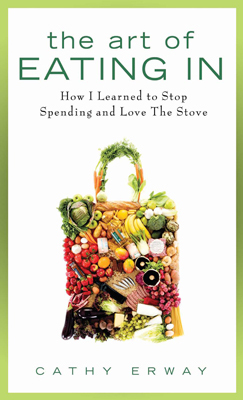 Cathy is passionate about sustainable eating and living, and the fact that in writing about her renouncement of eating out in New York , she was also able to paint a vivid portrait of the many innovative movers and shakers in the food scene here, is very telling. There is much more to eating in this, the greatest restaurant city in the world, than restaurants. Follow along on Cathy Erway's culinary adventure; not to the latest celebrated restaurant, but to her own kitchen where she finds something even more important than just better food-she finds herself. Read about the Week of Eating In Challenge on Huffington Post.